PRINCETON, N.J. -- Americans express as much or slightly more confidence in each of the three branches of the federal government than they did in 2014 and 2015, when their confidence fell to record or near-record lows. Public confidence in the judicial branch has recovered to 61% after slipping to 53% in 2015. Meanwhile, since 2014, confidence in the executive branch has climbed eight percentage points to 51%, and confidence in the legislative branch has improved seven points to 35%. 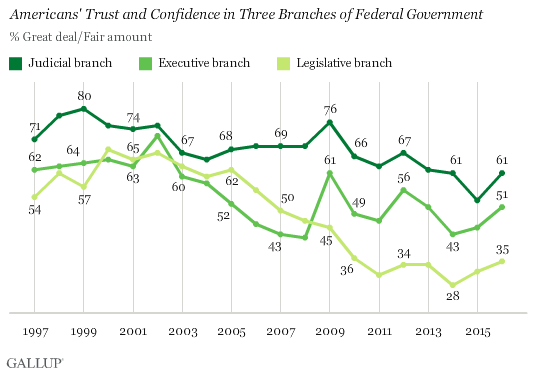 Confidence in each government branch is now similar to where it stood in 2013, but is still well below the averages in Gallup's annual trend since 1997 (68% for the judicial branch, 55% for the executive branch and 49% for the legislative branch). The latest results are based on Gallup's 2016 Governance poll, conducted Sept. 7-11, and represent the percentage of Americans saying they have a "great deal" or "fair amount" of confidence in each branch of government. At the other end of the scale, 24% of Americans currently say they have no confidence in the executive branch. Another 20% have no confidence in the legislative branch, while just 9% have no confidence in the judiciary. The remainder have "not very much" confidence in each branch or express no opinion. The recent increase in public trust in the executive branch largely comes from Democrats' rising confidence, which jumped from 77% in 2015 to 84% this year, consistent with President Barack Obama's improved job approval ratings. By contrast, increased confidence in the legislative branch has occurred about equally among Republicans and Democrats, although confidence remains in the 30% range among both groups. After plummeting in 2015 to 43% -- likely in reaction to Supreme Court decisions essentially upholding the Affordable Care Act and legalizing gay marriage -- Republicans' confidence in the judicial branch has increased to 51%. However, it remains below pre-2015 levels. Democrats' confidence in the judiciary is now at 71%, up from 64% in 2015. How much trust and confidence do you have at this time in [the executive branch headed by the president/the judicial branch headed by the U.S. Supreme Court/the legislative branch, consisting of the U.S. Senate and House of Representatives] -- a great deal, a fair amount, not very much or none at all? In the same poll, Gallup asked Americans about their confidence in the federal government to handle domestic and, separately, international problems. Here too, declining confidence since 2011 and 2012 appears to have arrested, and confidence has started to trend upward. Currently, 49% of Americans are confident in the government to handle international problems, up slightly from 45% a year ago and 43% in 2014. 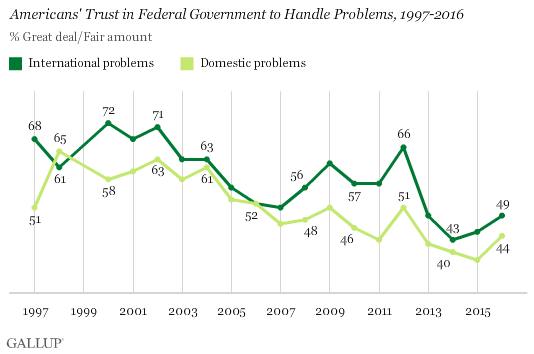 Confidence in the government to handle domestic problems is now at 44%, up from 38% in 2015. As with partisan confidence in the executive branch, increases in public trust in the government to handle domestic and international problems are mainly a function of higher trust among Democrats. This likely reflects their support for Obama in his final year in office after Republican presidential nominee Donald Trump and other Republican candidates for office have attacked his leadership. Democrats' confidence in the government to handle domestic problems has risen by 11 points over the past year, to 64%, and has increased by 10 points to 72% for international problems. Republicans' confidence in the government to handle each dimension is unchanged. How much trust and confidence do you have in our federal government in Washington when it comes to handling [international problems/domestic problems] -- a great deal, a fair amount, not very much or none at all? After several years of Americans' confidence in the federal government -- particularly in the White House and Congress -- wasting away, confidence has rebounded some. This is mainly because Democrats are feeling more positive. Republicans' views of the executive and legislative branches have not changed much; their confidence in each remains low. But their confidence in the judiciary has rebounded some after dropping sharply a year ago. These trust ratings are highly political, with Democrats and Republicans' views especially dependent on the party occupying the White House. The current pattern of high Democratic confidence and low Republican confidence will likely continue if Democrat Hillary Clinton wins the presidential election. Conversely, partisan confidence levels could reverse if Trump prevails. Meanwhile, confidence in the Supreme Court is mainly dependent on the nature of its big decisions. Any more cases that deeply disappoint the political right could send its confidence rating back down. Otherwise, it seems on course to recover. Americans' approval of Congress continues to edge upward to 20% in September, with Democrats buoying this increase. Republicans and independents still hold Congress in as low regard as they did in August. 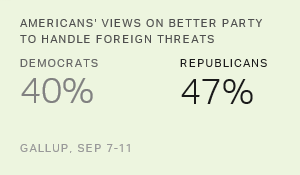 More Americans continue to say Republicans will do a better job than Democrats of protecting the nation from foreign threats, but the Republicans' lead has narrowed in the last year.